In terms of weekly reach, radio actually ranks the highest among the major media tracked by Nielsen, reaching 93% of the adult population, vs. only 88% for TV, 83% for smartphones, 50% for computers, 47% for TV-connected devices, and 37% for tablets. Put another way, the report estimates that radio reaches 270 million Americans (6+) each week. 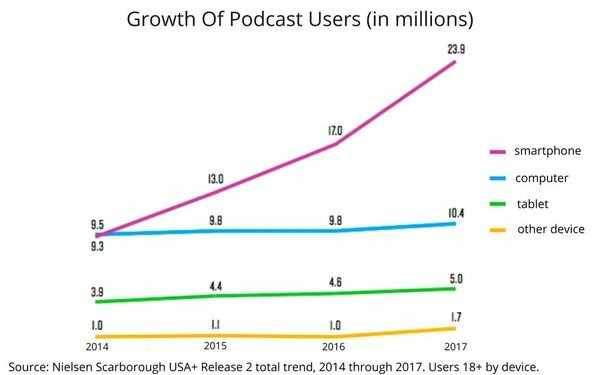 That said, one of the fastest-growing segments of “audio” is digital podcasting, which has shot up in the past few years thanks to the ubiquity of smartphones (see trend data in chart). 2 comments about "Podcast Augments The Radio Star, Nielsen Finds Medium Still Tops Weekly Reach". M Cohen from marshall cohen associates, April 5, 2018 at 2:13 p.m.
“Radio actually ranks the highest”.....Joe you sound surprised. But Radio has consistently been the number one reach vehicle for a long long time. And radio is strong across all demos, even younger Americans. The case for radio is a very convincing one! Kevin Densmore from Titanium Media Solutions, April 6, 2018 at 11:33 a.m. I'd love to see what the weekly 3+ reach. It would be disappointing if a lot of people were only reached once.